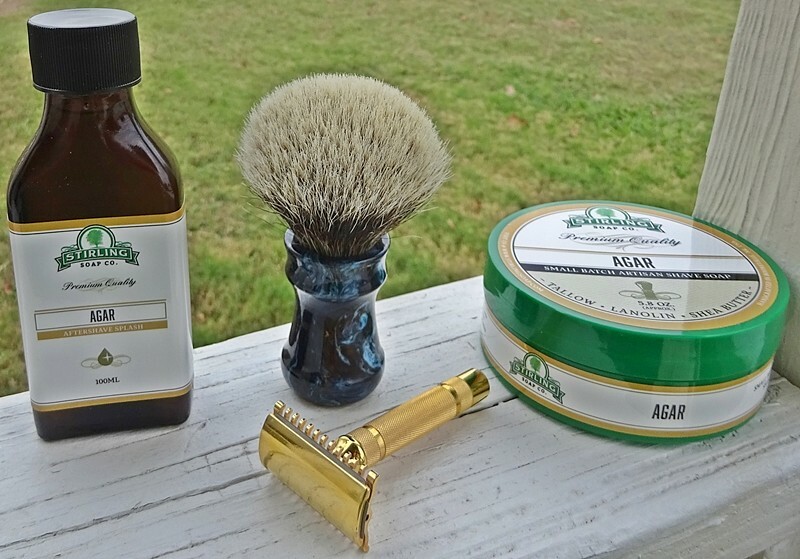 I had my first shave today with the final incarnation of Stirling Agar (Oud). The scent in my test puck was not as strong as I like. The final version is great! This scent is an immediate favorite for me!! Well done Rod! Needless to say, the performance is excellent too. I also got the aftershave (w/menthol)-love it!! Rod's soap base is top notch. I know he re-formulated his soap several times over the years. The current formulation is just outstanding. I hadn't tried Stirling in a number of years. My wife unexpectedly got me a tub of Peach for my birthday. I was honestly blown away by the quality of the lather. I have tried lots of soaps over the years. This formulation of Stirling, for me, is as good as any of them, and better than the vast majority. Really a nice soap. Bob , how would you compare the scent of this soap to CRSW Olfactory Hue? (12-01-2017, 10:15 AM)TheLegalRazor Wrote: Bob , how would you compare the scent of this soap to CRSW Olfactory Hue? Close-First Cousins, but not Identical Twins. Both are excellent, IMHO. (12-01-2017, 07:58 AM)kingfisher Wrote: Rod's soap base is top notch. I know he re-formulated his soap several times over the years. The current formulation is just outstanding. Interesting. I haven't used Stirling in about two years b/c I was getting inconsistent results back then. I always liked Rod's Barbershop scent, maybe it's time to grab a new puck. There's always a temptation! I just got samples of Piacenza, Executive Man, and Vanilla Sandalwood soaps. All three are AWESOME, and the samples are pretty sizeable, too. (I also picked up matching aftershave samples and preshave oil samples). They sell soap sample size empty tins on their website, so you literally can go and have a field day with sample pucks for $2 and purchase individual tins for all of them, and try any/all that you want for reasonable coast. This company has been the best value (performance for the money) that I have found yet. Kudos to Rod and Mandy for being able to offer these scents in 3 different soap sizes, for people with all types of budgets. I am super impressed. Nice to hear about this scent Bob. I'm a big fan of Stirling soaps and will have to grab one next time I place an order there.